Well before I put some rounds through a recently acquired Merwin Hulbert I thought I best ask about cleaning the gun afterward. I bought rounds from Buffalo Arms company that are listed as Black Powder so guessing this is the real stuff not a substitute. I tried looking at several other places but not sure I want to put water in the gun. I am probably wrong but this is an old piece and want to keep it running well. A couple of places mentioned using Ballistol but reading up on that seems more a lube than a cleaner but again I am pretty much out of my depth here. Advice please and thank you in advance. I use hot soapy water and then ballistol after. BP cleans up pretty easily. Where did you get the M&H? Windex with Vinegar to remove fouling. Then either Eezox of spray down with WD-40 for rust control. Yup, they were made to be cleaned with water. Just be sure to dry it well and finish with some sort of preservative oil. You can use mineral oil (Ballistol) or any good oil that will work with blackpowder. Now there is a good variety of lubricant/preservatives that work much better than Ballistol, although Ballistol will work unless you need good lubrication or better rust prevention. See Lumpy's suggestions for great examples. 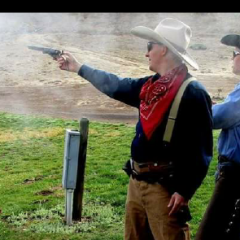 Pre coat the surfaces that are exposed to blackpowder residue before you shoot the gun. Lots of options for protectants and lubes and greases that will work. Clean the gun thoroughly within a day or so after shooting. Fouling attracts moisture, and it is moisture that is your enemy. Condensation that contacts the metal is the problem, but washing the gun with copious amounts of soapy water is a good way to clean it. Be sure it is dry after washing and re-apply a protectant immediately after cleaning. Rinse your brass within a day of shooting. Dry it, then tumble it for polishing. You are going to get a long list of products suggested. They all work. Pick one. If you don't like it, pick another. 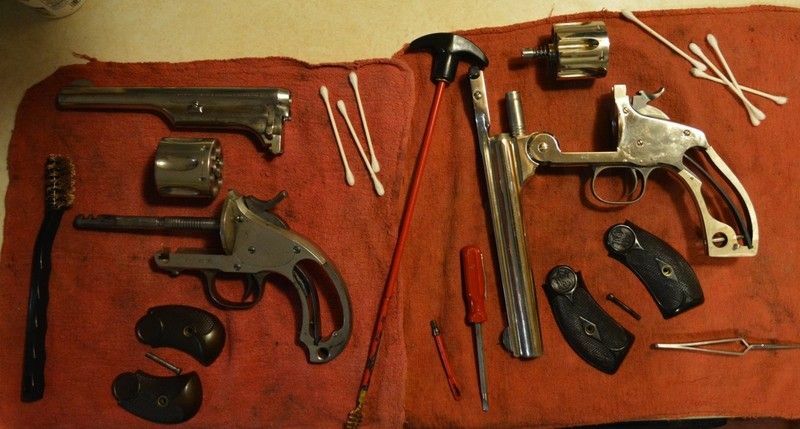 You already got the advice you need regarding cleaning your revolver. Water-based cleaning is standard for black powder firearms. Regarding cleaning of your brass - don't leave the brass wet too long. Corrosion can form between the primers and the primer pocket making depriming difficult. I wash brass then dry immediately. I had a MH Pocket Army with skull crusher grip. I found real black to be a hassle cause it gets into every knook and cranny on the over engineered gun. I would suggest APP and soft lead bullets, made cleanup for me so much easier. +1 to everything J-Bar wrote. My personal preference is for hot soapy water followed by a hot rinse, metal dries a bit faster that way. Also, if you have one available, an air compressor/blow gun is ideal for removing the water from all the nooks and crannies before oiling. I use Ballistol. Many BP shooters carry a water jug to drop the spent brass into, either at the unloading table if there's room, or at the cart. Since the brass is already wet, I went with wet tumbling with stainless steel pins. Pop the primers out, follow directions, and you have bright, shiny brass inside and out. Negative side of that is the initial cost of the set-up - but then, I no longer have to haunt the pet stores looking for Lizard Litter...or clean debris out of flash holes. I use lots of hot water and Ballistol to clean all my BP firearms. One caution; do not use water that has been through a water softener. The water softening salts in the treated water can cause flash rusting. Use plain tap water. Back in the late 1960s when I first started shooting Black Powder in Cap & Ball revolvers I followed the gospel that the best way to clean them was with hot water. Supposedly if the water was hot enough it would evaporate off the metal. Unfortunatley I usually got powdery flash rust on the metal after it dried. The other problem is getting all the water out when you are done. Leave any water inside and you will probably get rust down inside. So the advice was to completely disassemble the gun every time you cleaned it, so all the parts could be completely dry before reassembly. First, any revolver that I plan to shoot exclusively with Black Powder gets completely relubed with Ballistol before I fire a single Black Powder round through it. Black Powder fouling does not do well when it mixes with most petroleum based lubricants. I take the gun apart as much as I dare, then use a solvent to completely dissolve any lubricants inside, then I relube with a Black Powder compatible lube. I used to use lacquer thinner, but these days I find drugstore rubbing alcohol will do just as good a job. If it is a Colt type revolver I will completely disassemble it. With a Merwin Hulbert you don't have to go as far. 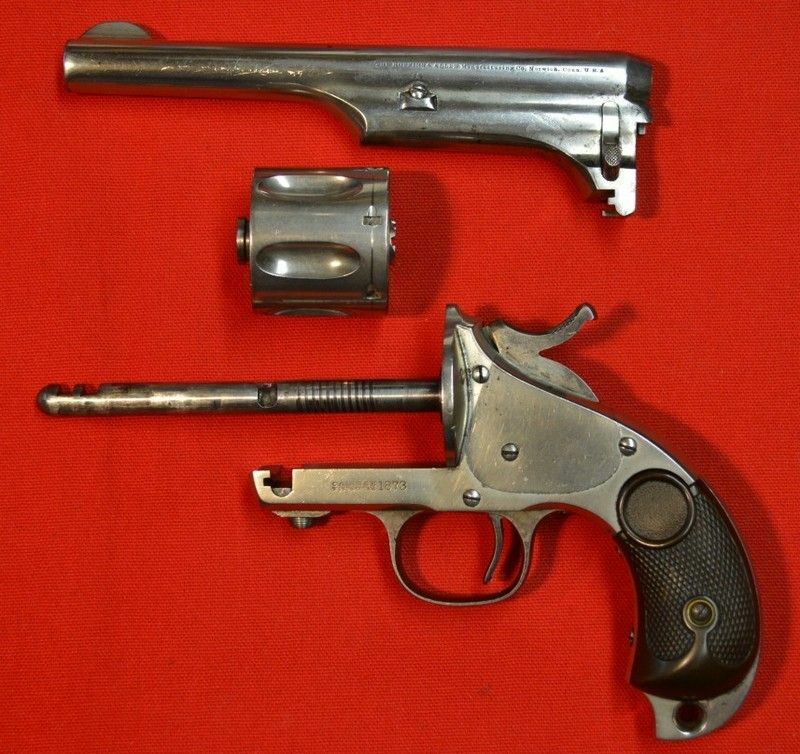 Break the gun down into its three major components. Remove the grips too. On this Open Top Pocket Army all I did was remove the side plate, the hammer, and the hammer spring. I did not go any further than that. Then plenty of q-tips and alcohol later the parts were down to bare metal with no oils left at all. Run plenty of alcohol soaked Q-Tip up into the hole in the barrel where the cylinder pin goes, and plenty in the hole in the center of the cylinder. Chambers and bore too, of course. Then a good dousing of Ballistol everywhere. Don't scrimp, leave a nice coating on everything. The reason will be revealed later. That's it, the gun is now ready to shoot Black Powder. Button it all back up again and you are ready to go. This only has to be done once, if you follow my method you will not have to take the gun apart again for a couple of years. Here is where I part company with most other Black Powder shooters. I don't clean with water anymore. You have to get all the water out again, remember? I have been using Murphy's Mix exclusively for all my Black Powder cleaning for years now. 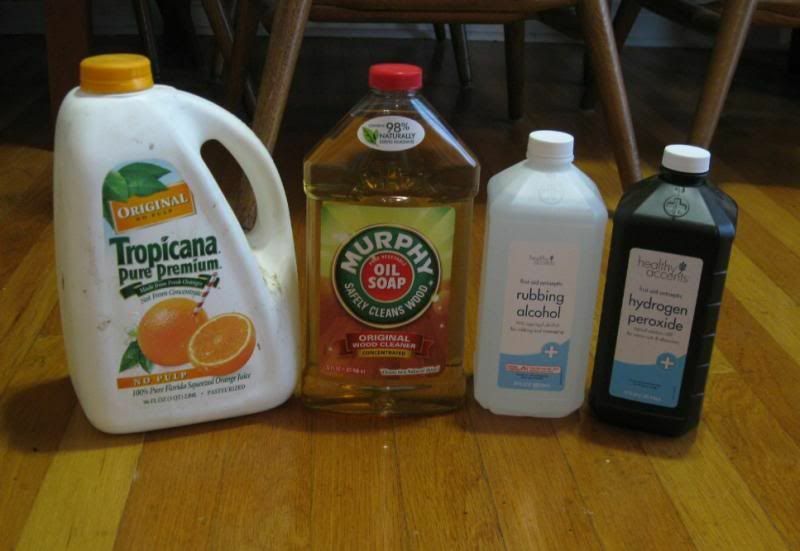 Go to the supermarket and buy 1 quart each of Murphy's Oil Soap, Rubbing Alcohol, and drugstore Hydrogen Per Oxide. Pour them into an opaque jug like this 3 quart juice jug. When cleaning time comes, take your Merwin Hulbert down to its three basic components again. Using plenty of MMix on a patch in the slotted end of your cleaning rod, thoroughly clean the bore and chambers. Same thing with the hole for the cylinder pin, clean it real well with patches until they come out clean. Clean all visible surfaces with MMix. Then run a patch soaked with Ballistol down the bore and chambers, followed by a dry patch to mop up most of the excess. Leave a light coating of Ballistol behind. Work some MMix into the slot in the frame where the hand pokes through and work some down into the slot where the barrel rides. Then work a little bit of Ballistol inside too. Now before you ask, why not simple plain water? Because you don't have to get the Murphy's Mix and Ballistol out again. You will find that some BP fouling has worked its way down inside the mechanism. But here is the little known fact: Metal coated with oil will not corrode when exposed to Black Powder fouling. It's true. Just leave any fouling that worked its way into the mechanism in there. Don't bother trying to get it all out again. The coating of Ballistol you left behind on the metal inside will protect them from the corrosive effects of Black Powder fouling. 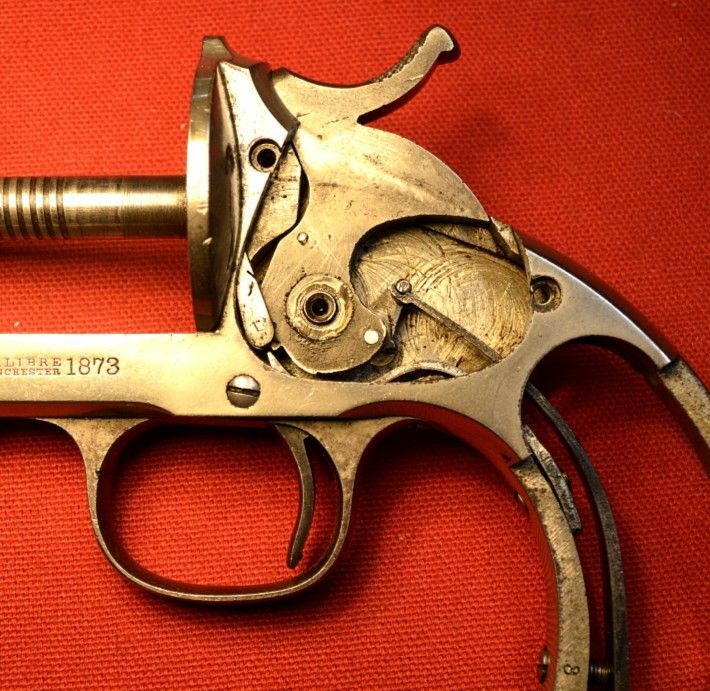 Every year or two take the gun apart again to clean out the black, oily gunk you will find inside. There will be no rust. Here is the thing about Murphy's Mix. Most of the cleaning is actually done by the water in the solution, the alcohol is about 20% water, and the H2O2 is about 97% water. That is what dissolves the BP fouling. The alcohol helps it dry faster, the H2O2 gives a little bit of fizzing action, and the Oil Soap leaves a nice coating of oil behind when the other stuff dries. It is the oil coating that prevents rust. No worries about rust inside, no trying to get all the water out, and you can do it at room temperature, you don't have to heat the Murphy's Mix, so you can clean right at the range if you want. Cleaning a Merwin Hulbert and a S&W New Model Number Three after a match. I did not actually have to remove the grips, but I did for this photo. Hint: Buy a big box of Q-Tips. I usually use way more than that. Shooting the MH at a match. P.S. I am too lazy to clean my BP guns the same day I shoot them. Usually tired after the match and need a nap. I try to clean them within a week. They will not corrode into a pile of rust if you wait a week. I won't tell you how long I have actually gone, but try to get to it within a week. Brass left unrinsed for more than 24 hours will corrode, so I try to rinse my brass out right away. I use similar to Driftwood and put it in my ultrasonic cleaner and just drop my pistols in and run. Dry afterwards. Also take a spray bottle of water and Ballistol with me to the range which allows some pre-cleaning before putting them away for the drive home. Thank you all!!! 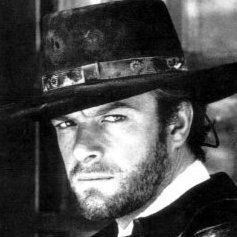 Next thin I know be shooting FC Gunfighter. Good Oldfashin Soap and Water is all that is needed to clean her with. Than wipe down with Ballistol or Olive Oil . First, remove the grips. Then spray it down real good with EZ-OFF oven cleaner. Then pop it in the microwave on high for about 10 minutes. Rinse and repeat. That should just about do it. THIS IS JUST A JOKE. I'm a general proponent of this method, but don't be fooled, it is not water free. Even the best rubbing Alcohol is 10% water and most of it is 30% water. And Peroxide is 97% water. That's why it works. Also Peroxide goes flat quickly in this mix. Replacing it with water result is a mix that works just as well. I rinse my pistols under hot water until they are almost too hot to handle and then liberally apply the mixture, scrub and rinse under equally hot water and apply a second application into the action and the barrel and all over the exterior and set the gun aside for long enough to clean the next one before I dry it off. Hang it barrel down and any remaining fluid will drip out quickly. The Murphy's part of the mix will leave a waxy coating behind. I keep them out a few hours before putting them in the safe to allow any residual water to evaporate then wipe then down one last time. I've cleaned my BP guns this way for almost 19 years-the biggest tip I can give you is don't be scared of water. I do not lubricate any more than the residual Murphy's mix and a single drop of oil into the action of each gun. Hi LV, I prefer quick and easy. I shoot 44/40 so there is very little to no blow back. I use baby wipes. Tear them to size and run them down the barrels. Usually 3 pieces per barrel, then a dry patch followed by a patch lubed with bore butter. I do the same with the cylinders. Clean out the innards of the rifle once a year. Basically I can clean my firearms anywhere I need to due to the fact that hot water is not needed. First, remove the grips. Then spray it down real good with EZ-OFF oven cleaner. Then pop it in the microwave on high for about 10 minutes. Rinse and repeat. That should just about do it. I can't really tell if you are serious or not. Unless you mean spray and micro-wave the grips. I must be missing something . You should never use oven cleaner on a firearm. It is caustic and will strip all of the oil from the steel. Leaving it highly prone to corrosion. And putting that much metal in a microwave is certain to damage not only the firearm but the microwave as well. It was a joke, Rex. Gotcha , I thought maybe so. My experience with micro-waves and metal has never been good. I use baby wipes. Tear them to size and run them down the barrels. Usually 3 pieces per barrel, then a dry patch followed by a patch lubed with bore butter. pre-coating. I use Ballistol mostly when traveling, but might try some of the other suggestions listed here. Recently I moved away from true BP to APP, my open tops never had an issue with the cylinders binding up from fouling, but my vaqueros do. The APP helped me get 6 stages without having to wipe the guns down. For APP I use Windex with Ammonia, then run patches till clean, then lube of choice. Really pretty simple. Enjoy the BP shooting! 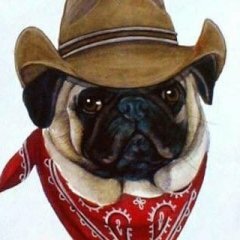 FCGF is a blast, hope you give it a go! My initial reaction is that I've been full circle in 40 odd years of shooting BP and have used all of the above back to using warm water and a soft brush for tough scale followed by ballistol or mutton tallow depending on the firearm. Gonna disagree with Lump on using vinegar based cleaners because it will play hob with flash rusting when used in a frosty or pitted bore. Sure, it works great in our slick Shilohs but so does water and ballistol. Another chemical I shy away from is peroxide.....it just isn't needed in my book. Driftwood hit it on the head with his observation about grease and fouling....its just not that big a deal. IMHO taking care of the brass is a more laborious job than the firearm itself. Decap with a range tool and dump cases into a jug of water with a little oxy clean or simple green. Scrub inside and out when you get home or use a ceramic cleaner. Be advised that ammonia products may harm that shiny nickle finish....I stir away from those too. I am also a member of the National Muzzleloading Rifle Association (N.M.L.R.A), and several years ago, in their monthly magazine, they came out with an article that advocated using plain old blue windshield washer fluid, that you can buy an most any store. I tried it on my Rossi Model 92 carbine, after a session of shooting cow patties in my Dad's pasture, and I must say it works really great. 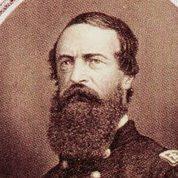 The way the magazine suggested to do this is: to stand your rifle, or revolver up, so that the muzzle is pointed upwards. You then stop up the breach end, with a clean rag, to keep the fluid from just running right through the barrel, and then you fill the barrel to the brim with the blue windshield washer fluid, and let it stand for about five minutes. You pour that out, and swab the bore with a dry patch, and repeat the process two more times. Then you dip a patch in the blue windshield washer fluid, and run it back and forth through the bore. You do this three times. Then you run a dry patch through it, and then follow that with one dipped in your preferred gun oil. That's it. Takes less time than many of the other methods, and it works. I bought my Rossi in the early 1980's, and have shot it with smokeless, some Goex, and also some Pyrodex, and cleaned it up with the blue windshield washer fluid, and the bore is still like new. It is quick, and it is relatively easy...a win-win for you and the firearm. The magazine recommends that cleaning method for muzzleloaders too, not just cartridge rifles and revolvers that you shoot blackpowder in. I figure the N.M.L.R.A. 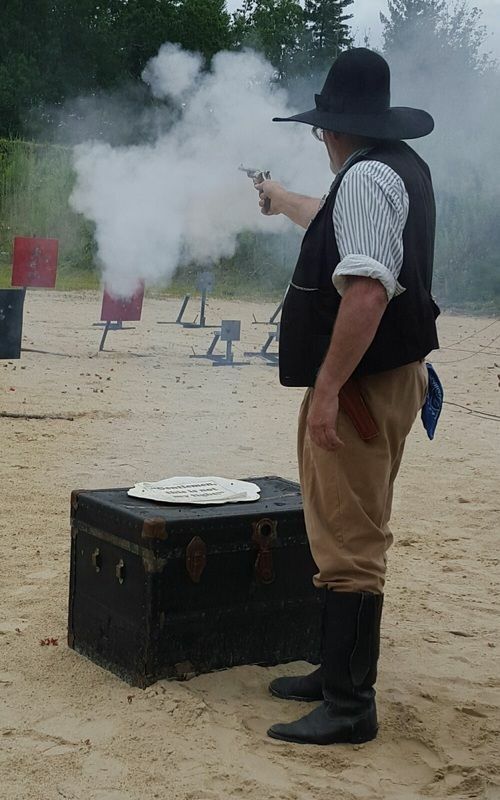 should know a thing or two about blackpowder, and firearms that use blackpowder, since that is mostly all they deal with, and their advice was sound. Another good thing about all this is the blue windshield washer fluid is readily available, and you can get a gallon of it cheap...and....it works!!! Ballistol works fine at the range, to keep the powder residue from gumming up, and keeping the firearm lubricated and working, and to spray down a firearm after you have cleaned it, and before you put it away for a while. I don't use it to clean the firearm with, however, but I do like the product. 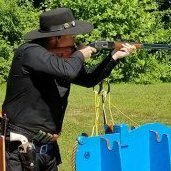 I have been shooting blackpowder firearms since 1965, and I was impressed with this technique of the blue windshield washer fluid in cleaning the bore of my firearms. Heck, just take off the grips and throw them in the dish washer!!! Not a good idea if you care about lead getting depostied on your dishes. My dishwasher always leaves a little bit of the last rinse behind. Whaattt!? You don’t have one hooked up in your garage? I clean my rifle barrel before cleaning the breech (carrier, bolt, extractor, etc.). I get one of my empty brass cases and coat it liberally with grease (presently Hoppe's Gun Grease, but if the tube of white lithium is closer I grab that) and put the greased case into the chamber, and close the bolt on it. Now I can pour anything I want into the barrel and the liquid will not leak past the greased brass into the action. Whether I'm using diluted Ballistol or hot soapy water, or whatever, I can get that barrel swabbed out and pretty darn clean without making a mess elsewhere. (Diluted Ballistol gets sprayed into the muzzle with pistol grip sprayer; hot soapy water is squirted into the barrel with a syringe.). Discard the liquid by pouring it out of the muzzle into an empty milk jug. The patches that get pushed through the barrel to dry it will clean out the chamber too. After the barrel has been addressed, I drop the greased case into the can to soak with the rest of my brass, and start work on the action. All the used patches and dirty paper towels etc that I generate in a cleaning session go into the milk jug too, and then into the trash. Work area stays pretty clean this way. I do that too J-Bar, except I've never greased the case to seal out the drips. What a great tip. I learn something new every day! PLUS ONE to J BAR --- Both. I also clean my rifles with a greased pig in the chamber. PLUS ONE to Driftwood. PAM is wonderful stuff. Much better than Ballistol. I clean my rifle barrel before cleaning the breech (carrier, bolt, extractor, etc.). I get one of my empty brass cases and coat it liberally with grease (presently Hoppe's Gun Grease, but if the tube of white lithium is closer I grab that) and put the greased case into the chamber, and close the bolt on it. Now I can pour anything I want into the barrel and the liquid will not leak past the greased brass into the action. I have been doing something similar to that for years. I put a spent case into the chamber before I swab the barrel down. I don't pour liquids down the bore, so I don't grease the spent case. I usually clean my rifle at the car before I drive home. I take a spent case (44-40) out of my rinse jar and place it in the chamber and close the action. Then I run a bunch of patches soaked in Murphy's Mix down the barrel until they come out a dull gray color. I do this with the rifle standing up, so the solvent and loose fouling flows down into the spent case in the chamber. At that point, all the fouling has been washed down int the the spent case in the chamber. Then I turn the rifle upside down and eject the spent case onto the ground. A spray of dirty solvent follows it out, so I stand clear. The spent case in the chamber prevents the MMix from 'leaking' past the spent case, so the action remains fairly dry. A patch soaked in Ballistol down the barrel, then a dry one to soak up the excess. Then I clean whatever area of the action is easily excessable with a few more patches and MMix, followed by the Ballistol treatment. A little more Ballistol dripped into the action and I am done. Takes about 10 minutes to clean my Henry this way.